It’s rare to have legitimately exciting news to announce in the world of Wi-Fi routers, but today we do: Tech giant Google has just unveiled a new $199 smart router called OnHub that lets you manage the traffic on your home Wi-Fi network via smartphone app. Aside from an aesthetically pleasing design, OnHub offers 802.11a/b/g/n/ac connectivity – basically, it will work with any device you have and support the fastest data transfer possible, up to a max of 1900 Mbps. It’s also designed to support a range of smart home devices via Bluetooth Smart Ready, 802.15.4 (ZigBee) and Weave (Nest). It’s future-proofed, which you should expect given its premium pricetag. The OnHub also comes with an impressive smartphone-based user interface. Rather than try to decipher what all those blinking light codes mean on your router, the Google On app tells you in plain language what problems are detected and what you need to do to fix them. It also gives you a simple means to view, manage and prioritize the bandwidth use of each device on your network. You can share your network password with visiting friends and family members through the Google On app – good news for those of us with obnoxiously long and hard-to-crack passwords. And don’t worry about router security issues – OnHub is designed to automatically download and install firmware updates. If you haven’t purchased a router for your home in the last 4 or 5 years, it’s definitely time for an upgrade to support all the newer, faster connection standards. At $199.99, the OnHub router is definitely a high-priced replacement, but I can’t deny that I’ve fallen in love with its feature set. It’d also be nice to replace my existing router with one that doesn’t look like a techie eyesore. 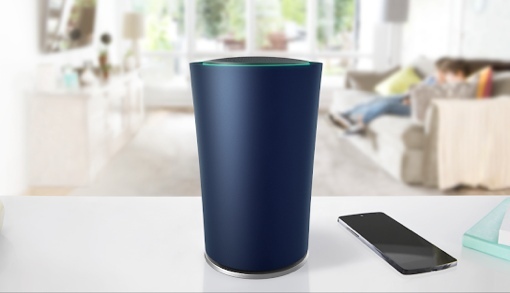 Unfortunately, the Google Store pre-orders for the OnHub smart router sold out almost immediately. You may have to wait until the router shows up on store shelves in the coming weeks – or for when it pops up for sale on Amazon. Amazon has it, but they’re charging $319 for it. How bad do you want it and how much are you willing to pay? The decision is yours for only a $100 more.